Princess Eadlyn has grown up hearing endless stories about how her mother and father met. Twenty years ago, America Singer entered the Selection and won the heart of Prince Maxon—and they lived happily ever after. Eadlyn has always found their fairy-tale story romantic, but she has no interest in trying to repeat it. If it were up to her, she'd put off marriage for as long as possible. But a princess's life is never entirely her own, and Eadlyn can't escape her very own Selection—no matter how fervently she protests. Eadlyn doesn't expect her story to end in romance. But as the competition begins, one entry may just capture Eadlyn's heart, showing her all the possibilities that lie in front of her . . . and proving that finding her own happily ever after isn't as impossible as she's always thought. First things first... I was a big fan of The Selection Series. Even though it could be cheesy at times, I enjoyed the characters and thought they had good amount of depth to them. 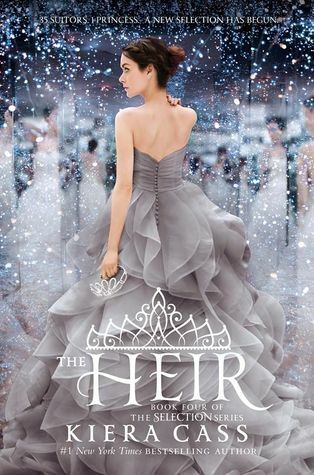 I hate to say it but that was not the case for the main character in The Heir. Eadlyn was snotty, rude, spoiled, and down right annoying. I was so surprised that Maxon and America could have raised such a spoiled brat! Even though Eadlyn was a little hard to handle at times, I did enjoy the male characters, and I loved getting to know their stories. I felt like the novel was pretty predictable from the start, but I still wanted to continue reading to see what happened at the end. I especially wanted to see which boy she chose and what happened with the status of the country. The Heir kept me entertained, but I can't say that it would be something I would recommend to others. Unfortunately I was a bit disappointed. I would've loved to see a little more of America's spirit in her daughter. Sadly, it was a predictable novel and it wouldn't make it onto the top reads of the year for me.